Community Services provides lifelong learning experiences for people of all ages, abilities and cultures through community-based programs and services. Programming is available for children, youth, adults, and senior citizens. Current offerings are located below. 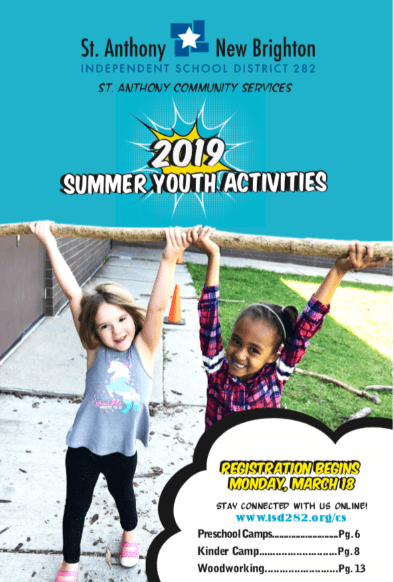 To preview the Adult brochure of 2019 Spring/Summer activities or Youth brochure of 2019 Summer activities, click on the image below. Early Childhood Family Education (ECFE) offers classes, home visits and programs designed to give parents and caregivers information, ideas and skills to support their child's growth and development from birth to kindergarten. All Day Preschool and Half Day Preschool provide the social and academic experiences necessary to prepare children for kindergarten in a creative, age-appropriate atmosphere that allows young children to explore and learn while promoting literacy development. Village Kids provides care before and after school and on non-school days for children in grades K-5. Summer Village Kids offers full day care for children who have completed grades K-5. We offer a wide variety of activities and classes for adults ages 18 and up, including technology, home improvement, recreation, athletics, fitness, arts, crafts and more. We provide a variety of academic and enrichment programs after school, in the evenings, to enhance your child's social, emotional and physical growth while out of school. Use of our facilities includes meetings and events, park and recreation activities, resident group meetings, youth athletic activities and special events of all kinds. RESERVATIONS must be made 2 weeks in advance of your rental. INSURANCE of 1.5 million in liability is required for most rentals. SPLASH PADS located at Central and Emerald Park are considered public area and cannot be privately rented. 2017 splash pad hours: daily, 12:00-8:00pm. We offer swimming lessons, water exercise, competitive swim, and more. 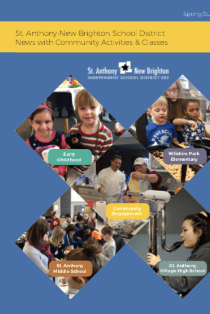 St. Anthony Community Services offers weekly card groups and exercise classes, enrichment activities, and trips for senior citizens.